What more can a Brit ask for? 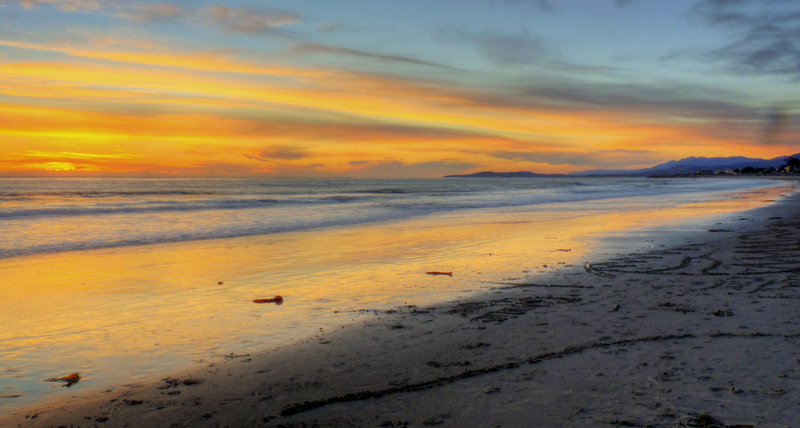 We find ourselves in a hotel just off State Street in Santa Barbara, CA, and within 100 yards are several pubs including a micro-brewery and several excellent places to eat including an Indian restaurant (and it's very good as well!). Oh, I guess the "authentic" British fish and chip shop should be included as well although this is the only "authentic" chippie I've ever seen that sells clam chowder and I didn't see mushy peas on the menu. But I'm told it's very good! Lunch here was rather splendid as well! The evening started with a quick sunset visit to Carpinteria Beach to see the oil rigs but they didn't spoil the view fortunately. 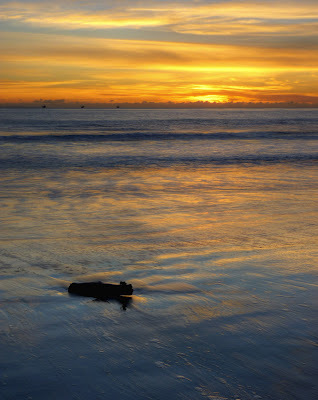 What a beautiful way to see off 2010 and welcome 2011. For anyone interested, today we released a short news article (with one or two pictures by yours truly) called Remote Operations Implemented for UKIRT. It's available via the UKIRT website. For anyone who wants a little more reading, we also recently published what might be our last ever newsletter, again available from the website or you can use the direct link - UKIRT Newsletter Autumn 2010 (careful, it's quite a large PDF file, around 17MB). There's plenty of history in it. And science of course. UKIRT's closed dome at sunset. It's after sunset but still we're still closed, the humidity is too high to open. Keck 2 isn't open either, but I'm cheating because this and the other pictures were taken a few days ago. Remote observing means no-one at the summit! I wish you all a very me...er...have a nice day! I also wish you a fiscally successful, personally fulfilling and medically uncomplicated recognition of the onset of the generally accepted calendar year 2011, but not without due respect for the calendars of choice of other cultures whose contributions to society have helped make our country great (not to imply that America is necessarily greater than any other country) and without regard to the race, creed, colour, age, physical ability, religious faith or sexual preference of the wishee. Having said all that, which I blatantly nicked from elsewhere, I wish everyone a very Merry Christmas and Happy New Year. 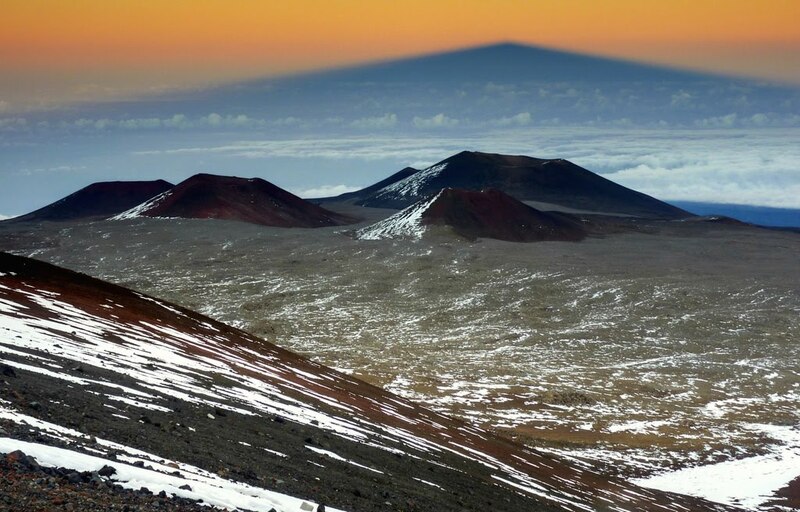 Mauna Kea's shadow on December 14th. Not much snow remains on the plateau or on the cinder cones but it's likely more is on the way next week. Hualalai volcano, turbulent low-level clouds and a little vog as well. This is from a few days ago (19th December) and worth watching through to the end as things get quite spectacular. Maybe you'll understand why I'm going to miss being on the summit so much! The video is from one of the CFHT webcams and there is an archive available from here. Just to be clear, these pictures weren't taken on my final trip to the summit, I know I'll be up there again, but were taken during my last trip as a support scientist at UKIRT last week. Nor am I leaving UKIRT - I've just moved into a bit of a different job there. I just couldn't think of a title that said all of that succinctly or in a way anyone not familiar with the place would understand. On the other hand, I don't have any more summit trips planned for a very long time, so this might be the last bunch of photos you'll see from the summit of Mauna Kea in this blog for quite a while. Well, unless I get bored and start re-posting old pictures. Don't think that isn't a possibility. My apologies in advance if I start doing that, but it'll simply mean I haven't figured out how to take pictures at sea level. Keck 2 at sunset - actually quite a few minutes after sunset and for once they decided not to start rotating and opening the dome halfway through a long-exposure shot I was taking. 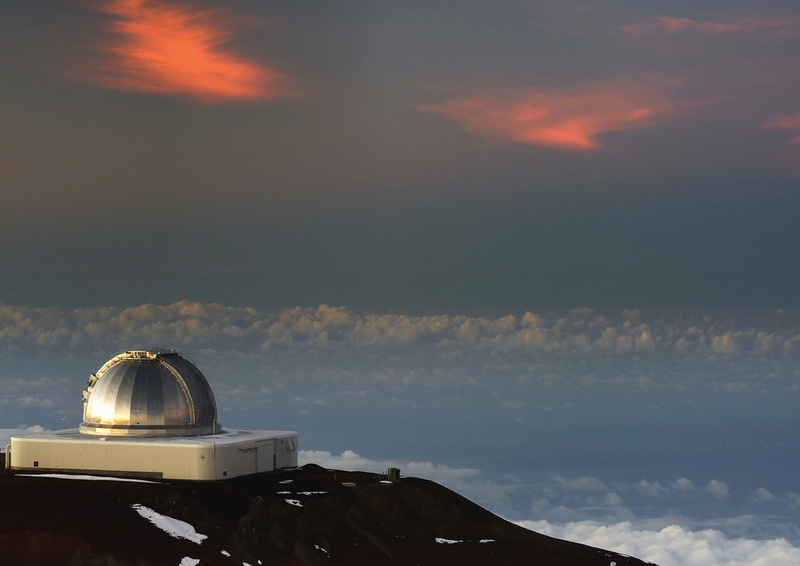 Those bloody inconsiderate Keck telescope operators! Subaru is open for a change. They've been closed for ages this year it seems although ask anyone there and they'll say it was for heavy engineering work on the top-end. A likely excuse. There's one thing I haven't seen before though and that's the strange metallic looking thing at the bottom of the open slit. I suspect it's a wind blind. 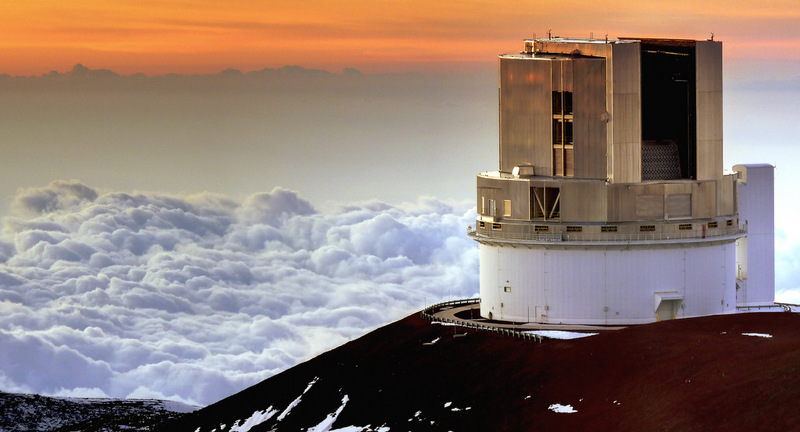 Most observatories have them, they're used to help block a strong wind and prevent telescope shake. Or perhaps it's just to prevent us seeing the party going on inside the dome. No, it's the former I'm sure! 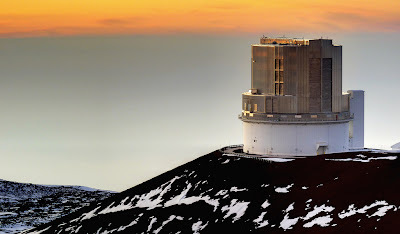 My old friend, the Gemini North Observatory. Like Keck they always try to ruin my photos by suddenly rotating the dome halfway through a shot of mine. Maybe someone passed on the message this time because just like Keck they kept still this time. It's a stunning telescope and always prompts lots of "oohs and aahhs" from the visiting tourists when it opens, especially on occasions like this when everything is open and one can see the telescope inside the dome. I have many good friends working there and am jealous they get to keep visiting the summit. 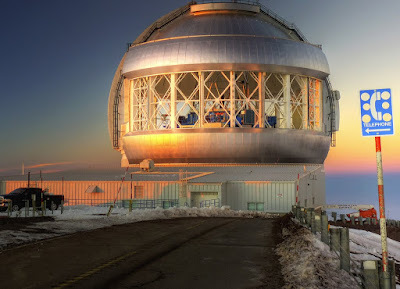 The CFHT always looks great after the sun has gone down, especially with the Earth's shadow behind it. 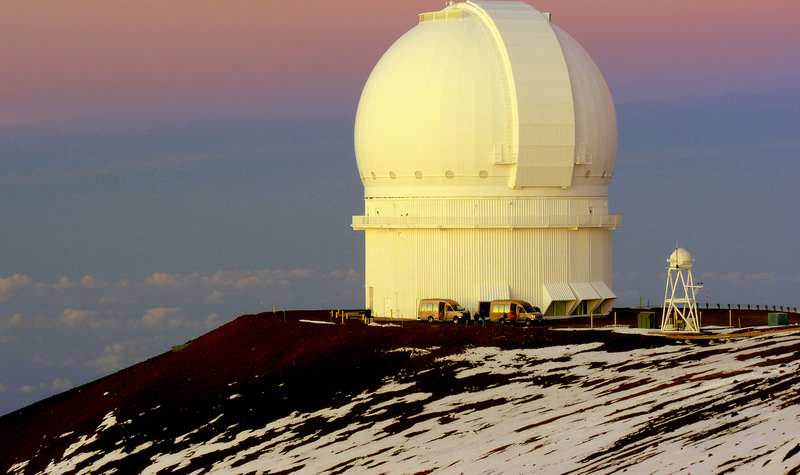 This is likely the next telescope on Mauna Kea to switch to remote observing. In fact I thought they'd beat us to it. This observatory has always been considerate, they rarely move the dome when I take a picture although the tourists can be a bit of a pain, what with them walking about and all that. And when they aren't in the picture there's always an inconsiderate astronomer walking along the catwalk intent on ruining my shot. Finally, the NASA Infrared Telescope Facility (IRTF) complete with what's left of the Earth's shadow. 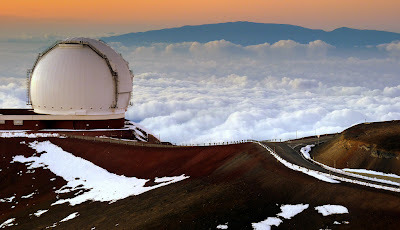 It wouldn't be correct to call this a twin of UKIRT but the primary mirror is only a little smaller than UKIRT's and it's also an infrared-dedicated telescope. There aren't many places like that around on the planet. They tend to concentrate more on Solar System objects than we do though, understandable really given NASA's interests. Well, that's it for now but there are a few more photos to come. None of them are my best just like these ones I'm afraid, but at least for me are quite important. Maybe in 20 or 30 years I'll look back at these and either reminisce with a tear in my eye or just laugh at how bad my pictures were in those days. There are still a few more pictures to post from my last "official" visit to the summit but they'll be of the "I've seen that before" variety. There are a couple of UKIRT that aren't my best but look OK although I'm going to use them in an article I'm writing so won't post them here right now. 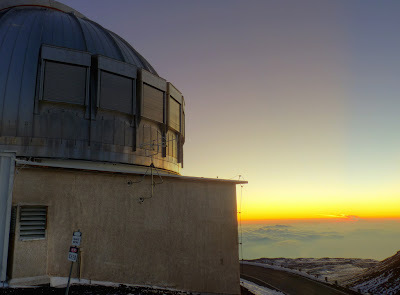 I've got quite a nice one of Mauna Kea's shadow, one of the CFHT and one of Gemini with all the vents open so you can see inside the dome. Still, you've seen them all before. There's a little snow this time though. Maybe that'll make all the difference! Just remember it's a little snow. In case you were wondering, the winter storm is still here so observing is impossible. It's not what I hoped for when starting remote observing but there's nothing I or anyone can do about it so we're in a holding pattern right now until the clouds go away. 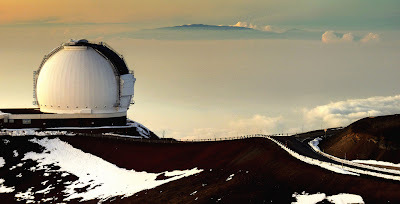 You'll have to excuse me, I'm reminiscing already, but last Monday, on the penultimate drive up to the summit to support visiting observers, I mentioned to our visitors that the vog looked really bad in the Saddle. 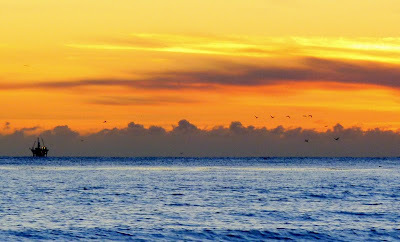 It turned out the vog had drifted well out into the ocean to the west which made the sunset view quite interesting. 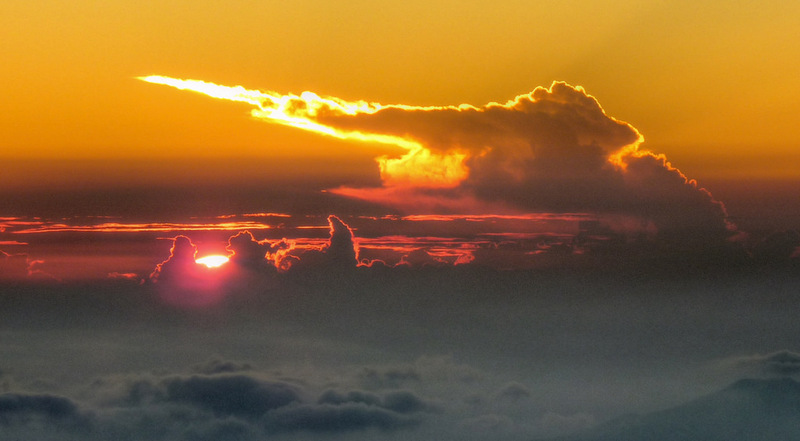 The island of Maui and its 10,000 foot volcano, Haleakala, looked as though it was floating on a mysterious fog. 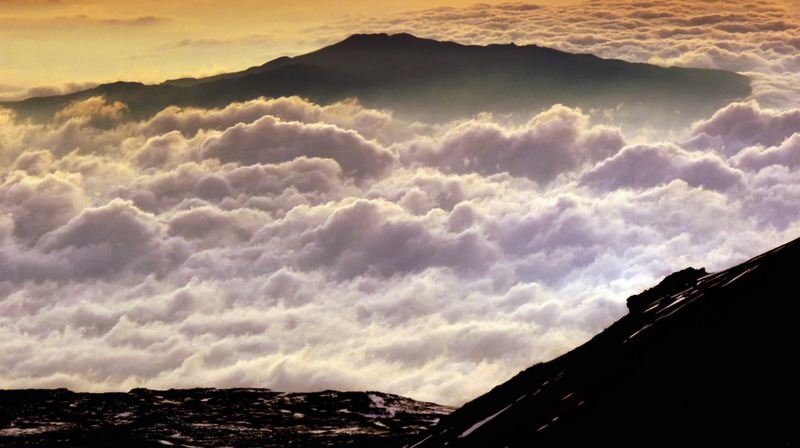 At this time of year the views from Mauna Kea's sumit are always fascinating. During the summer the weather is usually so good you'll get the same view day after day although for the tourists, for whom it's usually their first and last visit to this special place, the sunset is spectacular. 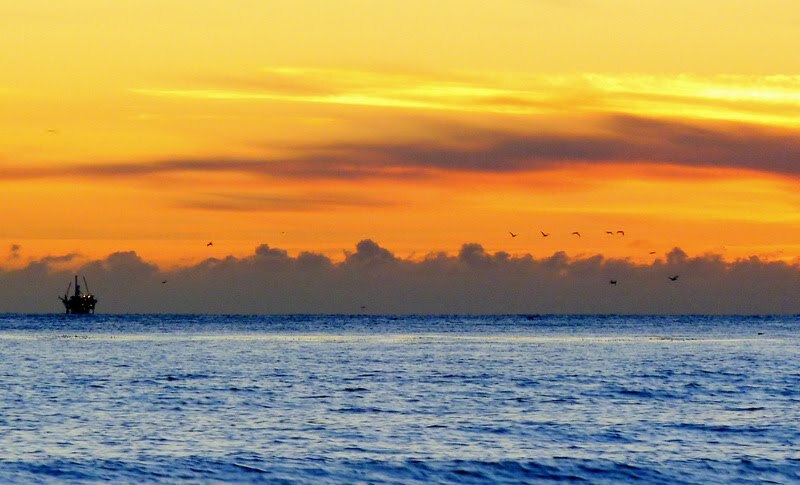 For us veterans, it's "Oh, did you watch the sunset? It looked quite nice - same as last night in fact". During the winter, however, there's always something interesting going on, be it snow, ice, high clouds or body-numbing high winds and freezing temperatures. Although not quite as spectacular, the Pacific Ocean beyond Subaru was invisible, it was masked by the heavy vog. Sigh, back to the current time and place - sea level and no view of the sunset. On the other hand, we're in the middle of a long-lived although relatively minor winter storm and you wouldn't see the sunset from the mountain anyway. The storm has dropped a few inches of snow on the summit but nothing too major yet. I still suspect January will be a bad month for the summit though, I'm expecting a few feet of snow rather than a few inches. 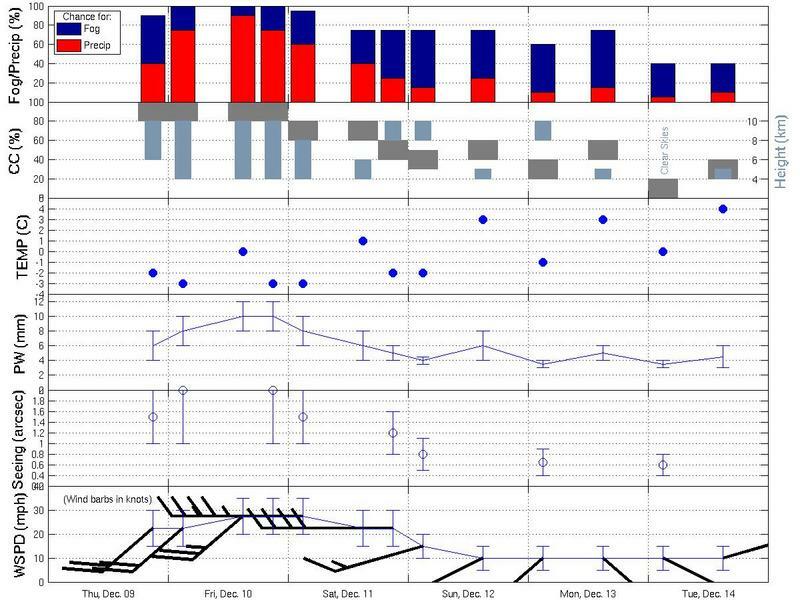 It should make remote observing interesting if I'm right. Another picture from last week and something else I'll miss by not working on Mauna Kea anymore - winter's arrival on the summit. By the time we were up there much of the snow had melted as it often does at this time of year - January and February are usually the months for sustained snowfall and little melting. Still, as I write this, another winter storm is approaching and just an hour ago the report came in that snow was once again falling at the summit. This could be a long and difficult winter for the observatories atop Mauna Kea. It'll also be interesting for those of us who have just switched to remote operations! There will be no more stepping outside briefly to check on the conditions. Having said that, I still remember commissioning the MICHELLE instrument at Gemini several years ago and many of those nights were spent in Hilo at sea level with a crew at the summit. For the first few days I would still step outside when the summit crew reported that conditions were deteriorating and would report back that "it looks just fine from here!". This swan got angry with me. Not sure why. The ducks were having a great time surfing the icy lake and maybe he simply got fed up and decided I was an easy target. I can't quite work out what this looks like. It's either a strange view of a world filled with glowing red lava lakes after the apocalypse or something that reminds me of my old astronomy lectures on astrophysical jets. It's neither of course, just cloud on the distant horizon illuminated by the setting sun, but I think it looks really cool. This was taken shortly before we left UKIRT last night. 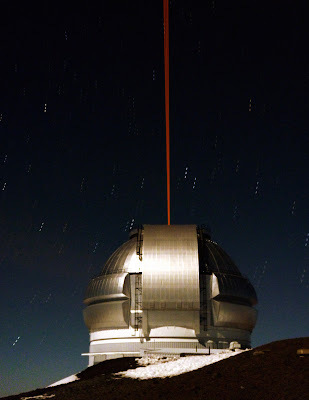 It's of Gemini and its laser and I'm so pleased we saw this because this was one of our visitors' first trip to Mauna Kea, in fact it was her first observing run full stop and things hadn't quite gone to plan thanks to the recent storm. 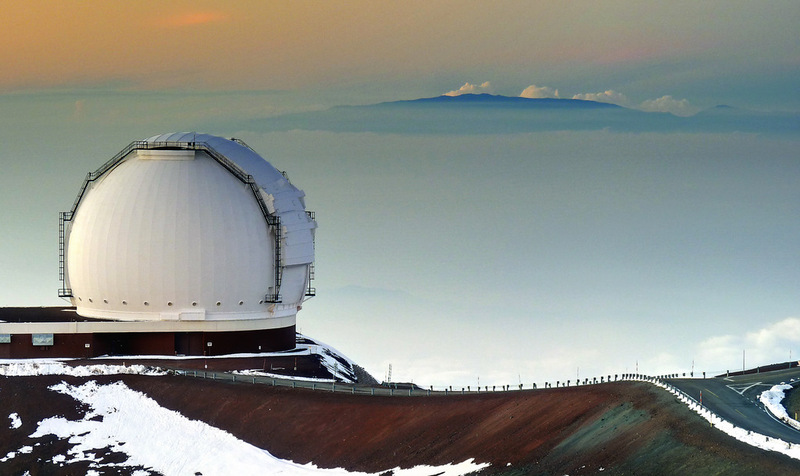 She enjoyed this view though - yet another spectacular sight any visitor to the summit of Mauna Kea will see! (She also got to control the telescope this evening which few, if any, of our visiting astronomers ever get to do!). Actually it's not one picture as the more astute of you might figure out, it's an average of three separate pictures (each 60-secs long) hence the broken star trails and the seemingly triple laser beam Gemini is using. I also doubt very much it'll really be the last picture I take from the summit! I mentioned in my last post that I hadn't felt emotional so far but might later on in the night. Well, I'm not embarrassed to admit that when I started to pack up my gear before we headed down I nearly lost it. What a strange feeling. One minute I was fine the next I had tears forming and just had to stop. I even told our visitors I needed a moment to compose myself. It seems many of our final visiting observers have felt the same way, one or two wanting to hug the telescope on their final night and the previous observer being cruelly denied from saying good-bye to the telescope by the winter storm. Even us hardened scientists can be emotional when it comes to inanimate objects! Although perhaps it's just because UKIRT has been responsible for making many people's careers in astronomy, including my own. The good news, of course, is that UKIRT is not closing yet, it remains operational and the year 2010 looks as though it will be the most productive year in its 31-year history in terms of the peer-reviewed scientific papers it generates. There's still fight in the old girl! This evening was spent in the office for our third night of remote observing and a new experience - watching us take data with no one in the control room at the summit. At least I could cheer myself up as the England cricket team got off to yet another wonderful start in the third Ashes test match (although they're making a hash of getting that last Aussie wicket as I write this - you can't have everything!). 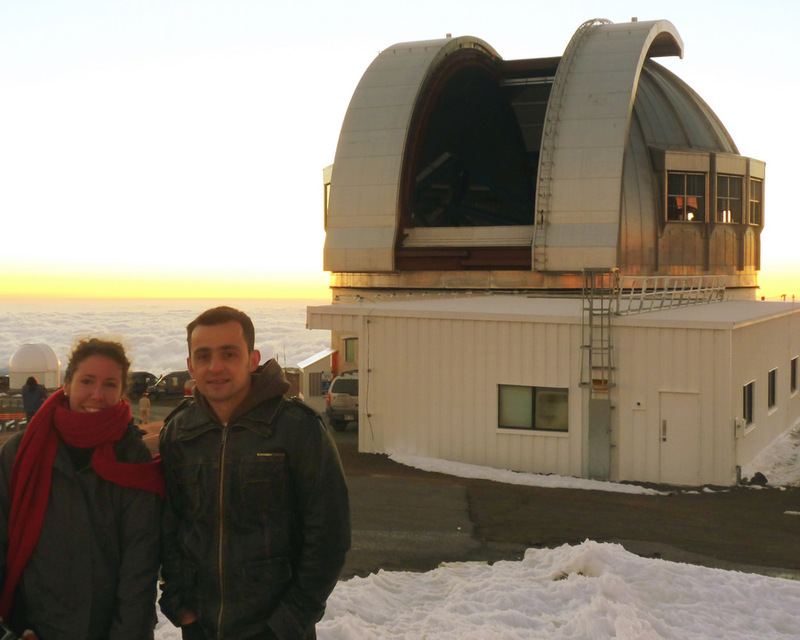 Meet my good friend Omar Almaini and his PhD student Caterina Lani from The School of Physics and Astronomy, The University of Nottingham. We're all sat up here at UKIRT twiddling our thumbs as everything is being controlled from sea level but this is a rather special run as they are the last visiting observers scheduled to be at the summit. Tomorrow we go down to Hilo and continue the run from there. Watch out for some final sunset photos from tonight and last night in the next few days! I thought I might feel a little emotional tonight, this being my final scheduled night on the summit as well (although I suspect it won't be), but so far I'm not, perhaps because I'm so relieved that remote observing is working so well! Anyway, perhaps I'll start to feel sad when we start to head down to our accommodations a few thousand feet below. 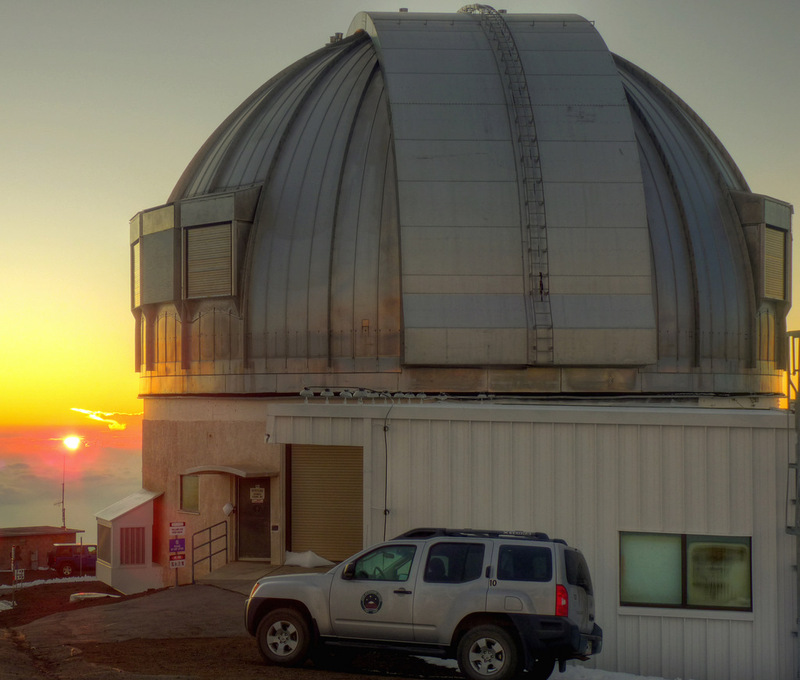 Well, I shouldn't count my chickens, but tonight is the first night of remote operations at UKIRT where the telescope, instruments, data reduction and all the other things required to take data are being run from Hilo at sea level. A small group of us are at the summit in case anything bad happens which so far hasn't. In fact we're taking real science data when I expected we'd actually be doing engineering tests, so this has gone better than expected and I'm a very relieved head of operations! In place of our regular summit operator, Pele Mascotte is sitting by the controls, just in case. Things are as hectic as a very busy bee after accidentally mistaking top-grade cocaine for pollen and then landing in a bottle of Four Loko (look it up if you don't know what I mean!). Tomorrow we start remote operations at UKIRT despite the storm that has just hit the island. Music often keeps me relaxed, but I also love watching sport (I used to participate as well until my body started to fall apart), and thought this video was a nice combination of the two. It's a Friday evening and I should be out at the pub or something but after one of the more hectic days I can remember I'm at home finishing off all the stuff I ought to have done during the day. The storm that hit the Hawaiian islands has really thrown all my plans out of the door and I'm trying to be quick enough to rush outside and catch them all before they get washed away. 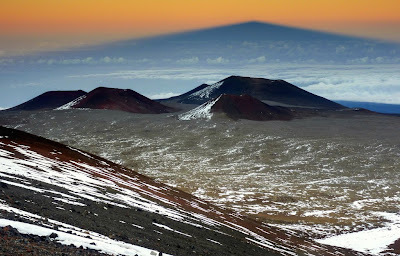 Having said that, there's been little rain here but the summit of Mauna Kea is being covered by a blanket of ice and snow as I write this. The weather forced our day crew to evacuate early this morning and the critical engineering work we planned for today didn't get done. Oh well, there's always Monday and that depends on the crew working on Sunday to clear the snow around the dome. Winter on the mountain almost always increases the overtime budget! Tonight I've been doing all the stuff I planned to do during the day so it was nose to the grindstone. On a Friday evening. I ask you. And in the middle of all of this there was a gentle tap on my shoulder. Not a slap or a clawing of flesh, but a simple tap to let me know someone was behind me. I didn't think cats could be so polite, but she silently climbed up on the desk behind me, waited her time and when she realised I didn't know she was there just tapped my shoulder two or three times and ever so gently. Then, of course, once she got my attention, she did her usual posing thing. There's also Eddie of course, the other female in the house. Unfortunately she doesn't like the camera and was not as polite as Bubbles, so she doesn't get to star tonight. But I'm sure she will soon! No, I'm not leaving but have considered it over the last couple of months! Just a beautiful piece of music from Leonard Cohen. I've never been a fan of his but this performance in London a couple of years ago has changed my mind. I've been listening to this song at work just to keep me calm and collected this week. Anyone willing to buy me the DVD/CD for Christmas?! A few weeks ago the weather on Mauna Kea was as benign as it comes. The winter seemed a long way away and so did my planned date of switching to remote operations on 13th December. Well, that day is almost upon us, just a nice relaxing weekend (yeah, right) to come after what I suspect will be a rather busy day tomorrow. Right now, it seems I couldn't have picked a worse time. Of course I didn't know that so many weeks ago, but there was always the risk that the winter weather on Mauna Kea would have a say - and it seems it might just do that. Unfortunately, making changes as large and complicated as the switch to remote operations isn't something you can do in a day or two, it needs months of planning and work so you have to pick a date which is realistic in your mind and then stick to it. It's not just local staff that are affected by this, but we also have to plan for observers coming from around the world (or not, as the term "remote observing" would suggest) so we can't just plan this at the last minute. Nor could we choose another time of year to do this due to funding and scheduling constraints. Nevertheless, I chose 13th December - at least it's not a Friday! The summary above is from the MKWC. Whenever you see bars at the top it's usually bad news. When they are red it's really bad news, and if you see them during winter it usually means snow and ice. From the same site, this is an infrared satellite view of the islands. Deep red means severe weather (usually thunderstorms) and is heading down the island chain. So I'm on the mountain early next week for the transition to remote observing. This isn't the idea in general, I'm only there in case things go wrong on our first couple of nights and we need intervention from someone on the mountain (which I'm not expecting, but I'd be foolhardy not to allow for the possibility). Then again, maybe we'll need someone up there to start clearing the snow. This wouldn't be the first time we've commissioned a new mode at UKIRT in the most difficult conditions and circumstances, in fact we seem to make a habit of it! Many years ago I commissioned an instrument called MICHELLE at UKIRT and for some reason we decided that the first science run, with a visiting observer, would be mid-infrared spectropolarimetry. 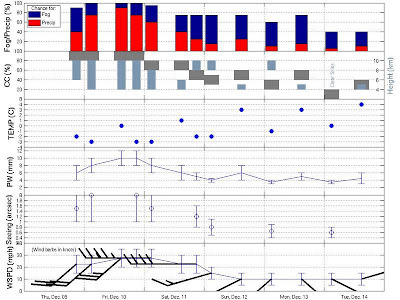 Believe me when I say there are few observing techniques from a ground-based observatory harder than this and to do this on your very first night with a new instrument? Anyway, please wish us luck. This is a huge change for us and although I'm confident things will be OK the weather may well scupper initial commissioning and then we'll be in a most interesting situation! Well, I suspect it's some sort of goose. Or maybe a duck. Or something else. Ornithology was never my strongest subject at school and it wasn't helped by the fact they never taught it. 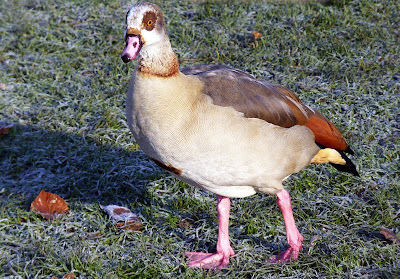 Anyway, this was one of a pair of birds I saw at South Hill Park in Bracknell, Berks, UK, a week ago, just before the big freeze in the UK set in, although it was bloody cold when I took the picture. Since that Sunday morning I think I may have figured out what this bird is, but to avoid contaminating the results I wondered if anyone else could tell me what it is. If I'm right, then EG is its initials. I'll have to see if I can get hold of the movie, it's probably been 30 years since I last saw it, although I believe there's been a remake since then. I haven't seen it though. 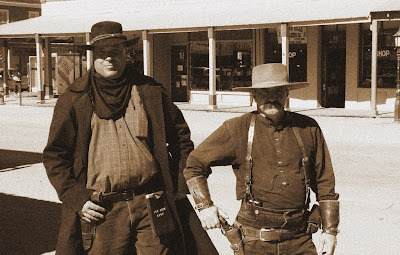 These guys wanted to keep the olden days going I think so it's only fair the picture format is sepia. I'm still kicking myself for not cleaning the camera lense before this trip. I've a bunch of photos that could have been really good apart from the dust screwing everything up. 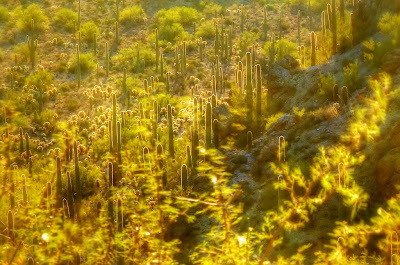 Anyway, no, I'm not in Arizona, these shots come from a couple of weeks ago. I left the UK the other day just as the big freeze started to hit the south and am pretty pleased with myself for leaving when I did. It was bloody cold even before I left. The photos look better if you click on them although you can then start to see where I tried to remove the dust spots!